Mizuta Noriko (b. 1937) has published a half dozen volumes of poetry in Japanese in addition to her translations of works by Sylvia Plath and Anne Sexton and over a dozen scholarly volumes in comparative literature, poetry studies, and feminism. Among other honors, she has been awarded the Pro Cultura Hungarica Prize (2011) and the Cikada Prize for Poetry (2013). 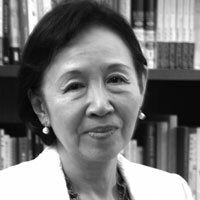 She earned her Ph.D. at Yale University in 1970, and taught at University of Southern California before returning to Tokyo where she currently resides. Jordan A. Y. Smith has translated poetry by Mizuta Noriko, Yoshimasu Gozo, Usami Kohji, and Nomura Kiwao, and prose fiction from Alberto Fuguet and Fernando Iwasaki. He is currently Associate Professor in International Humanities at Josai International University, and has previously taught comparative literature, Japanese studies, and English at California State Univ Long Beach, UCLA, Roger Williams University, UC Riverside, Pepperdine University, and Korea University. He also researches in global comedy and translation studies and writes poetry/spoken word pieces.